I am always frequently thinking about eating healthier and often one of my New Years Resolutions involves just that. The best kept set of resolutions happened while I was deployed one winter. My goal was to "strive for 5" servings of fruits and vegetables each day. I kept it simple and started off slowly. 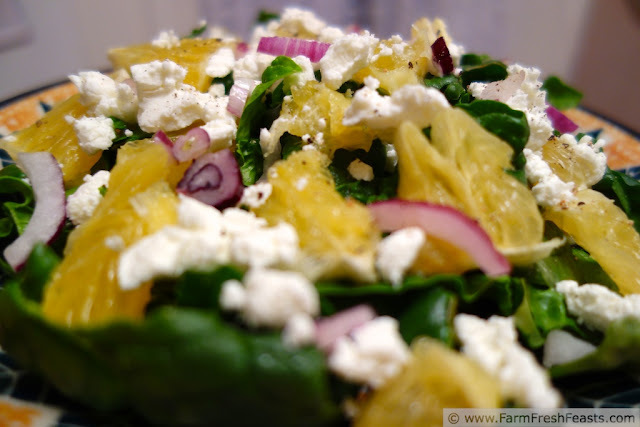 Frost-kissed spinach and Band Fundraiser Oranges with red onion and goat cheese. Yum! In February, I resolved to eat 1 serving of veggies a day and continue with January's fruit resolution. In March, I added in a second serving of fruit to the existing list. In April I added a second serving of vegetables. In May, I added a 3rd serving of either fruit or veggie. I had reached my goal of 5 a day. *I don't mean I only ate 1 serving of fruit each day. I ate other things. And even other fruits and vegetables. But if it was 5 pm and I'd been snarfing down bread and cheese all day, I know I had to get a piece of fruit in me before bedtime. Of course, soon after I redeployed and returned to what passed for regular life, my goals kinda slacked off a bit. (Who am I kidding? That month I moved from Europe to Asia with a stop in the US to remarry my spouse. I had other things besides fruit and veg on the plate.) But to still be doing in May what I'd resolved to do in January was a good achievement in my book. 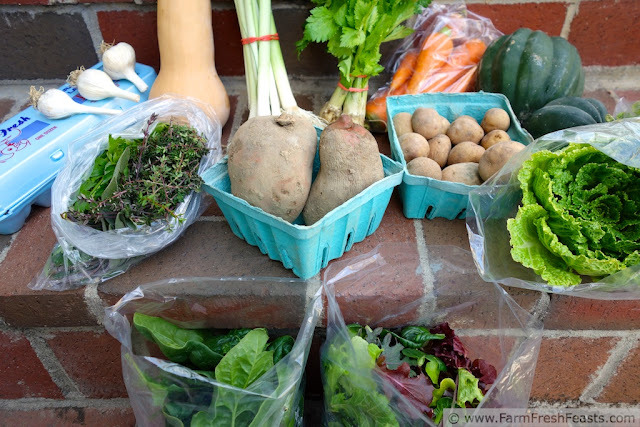 A typical late fall/early winter box from our CSA, Patchwork Gardens. • 1/4 cup raisins is a serving of fruit. Raisins keep well in the pantry or your locker. • 1/4 cup salsa is a serving of veggies and you can eat it with eggs in the morning or tortilla chips in the afternoon. • If all else fails, keep small cans of V8 in the pantry. Next to the raisins. • 1 cup of lettuce is a serving--don't skimp on your sandwich. • The more vegetables you eat before 2 pm, the more you can slack off with dinner. • Pay attention to labels. 100% juice = 100% juice. 100% Vitamin C does not equal 100% juice. • Hummus (love me some Costco!) is great with 1/2 cup serving of sliced carrots or radishes or cucumbers or zucchini or mushrooms or celery. • My Vitamix is my friend. Together we've been making beautiful smoothies for over a decade. • If you set out pre-chopped veggies, pre-peeled or pre-sliced fruit, your family will eat it. If they don't eat it all, you can freeze it and toss it in your smoothie. • Joining a CSA farm share means that you keep getting fresh local produce in your kitchen all growing season long. You need to do something to it, sure, but thats what this blog is all about! What are your New Years Resolutions, or do you resolve things any old day of the year?? 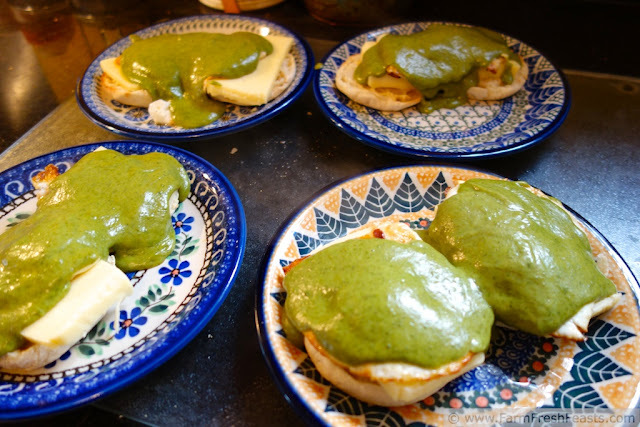 Green Eggs No Ham--a vegetarian Eggs Benedict for Dr Seuss' birthday. Your CSA goodies look so good! Have a great new year! They sure do look good. I've been fortunate to strike it rich 3 times with 3 different CSAs in 2 states. I love this plan...very smart and wise. And those dishes are gorgeous. Polish pottery? Good eye, yes, I've got Polish pottery dishes. My brother hauled over the plates, my folks hauled over the bowls. I couldn't let the movers haul them the mere 500 miles of our last move, so they got to ride in style, just like the composting pigs! Now if only I would set up a Boy Push Up monthly plan . . .